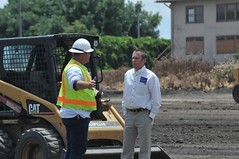 Nahets Chairman, Matt Klabacka, visits with Northern California College of Construction training director, Tom Champlin, at their field site in Stockton California. As Texas Authorities searched the Area of Gregg County after a stolen backhoe had been reported, there was an accident reported in which a Volvo backhoe had been driven through a fence along with several other pieces of heavy equipment. Lt. Mike Claxton said his office investigated the theft of a Volvo backhoe from 10730 Texas Highway 149 on Friday which was driven through a fence and loaded on a trailer. “This is the third reported heavy equipment theft in this area of the County since May 29,” Claxton said today. Investigators that have been working on the case are just waiting for more information on the crash. The Investigators are looking everywhere for information on the thefts. Suzanne just returned from agency conference in Missouri and the Missouri Vocational Rehabilitation recognized the Oklahoma College of Construction for the third year in a row for our outstanding contribution to their customers. Our customer assistance is something we value greatly here in Oklahoma. Many other schools were nominated for this award, but we were the only one to recieve it.